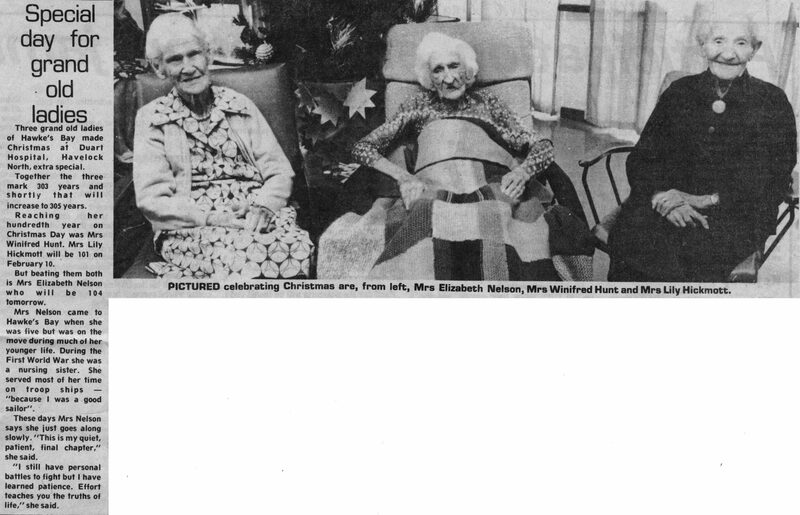 Three grand old ladies of Hawke’s Bay made Christmas at Duart House, Havelock North, extra special. Together the three mark 303 years and shortly that will increase to 305 years. Reaching her hundredth year on Christmas Day was Mrs Winifred Hunt. Mrs Lily Hickmott will be 101 on February 10. But beating them both is Mrs Elizabeth Nelson who will be 104 tomorrow. Mrs Nelson came to Hawke’s Bay when she was five but was on the move during much of her younger life. During the First World War she was a nursing sister. She served most of her time on troop ships – “because I was a good sailor”. These days Mrs Nelson says she just goes along slowly. “This is my quiet, patient, final chapter,” she said. “I still have personal battles to fight but I have learned patience. Effort teaches you the truths of life,” she said. Photo caption – PICTURED celebrating Christmas are, from left, Mrs Elizabeth Nelson, Mrs Winifred Hunt and Mrs Lily Hickmott.